A report says that Iraq and Afghanistan are being left to mercenaries, as the number of private contractors in both countries has risen by over a quarter - all with the approval of the White House. It has been revealed the number of private security contractors working for the U.S. war effort in Iraq and Afghanistan has greatly increased by up to 30% since President Obama came to office. While troops are being pulled out, a Pentagon report says that the number of contractors working for the US Defense Department has increased dramatically. This figure has now swollen to 250,000 outsource personnel working for companies such as Blackwater and Triple Canopy, and this process could be called a “privatization of war”. 25% of all the troops in Iraq are private contractors, while the number of private security contractors in Afghanistan is even higher – practically 30%. This means that, even though President Barack Obama promised he would withdraw troops from Iraq, we see quite the opposite: an increase of private security personnel deployed to Iraq and Afghanistan. This essentially allows Washington to keep its grip on the operations taking place in both countries. 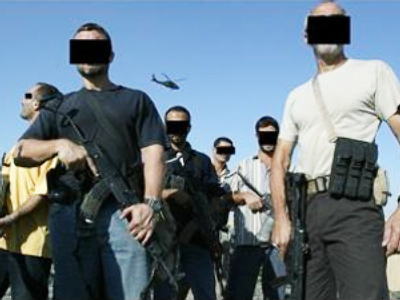 Some of these private contractors carry weapons, some of them don’t. Some of them support combat troops. Some of them are Americans and some are not. They have also been dubbed by critics as ‘shadow warriors’, first of all because they operate in secrecy, and also because the deaths of such private contractors are not accounted for in the total count of losses we see from the US government. What is more important is that private security contractors are not held accountable for their operations, for example for the civilian casualties allegedly caused by them. This unaccountability allows Washington to more or less wash its hands of what is happening on the territories of Iraq and Afghanistan. This is the problem that many critics are charging Obama’s administration with: a hypocritical disparity between words and deeds. Because of this lack of accountability, America’s presence in Iraq has been marked by numerous scandals after shootouts caused by private contractors ended up in the deaths of unarmed civilians. The Blackwater company has been involved in the most high profile cases. Despite all the scandals, Blackwater is still operating in Iraq under different names, and recently Washington signed a new multimillion contract with Xe company (formerly Blackwater). Despite the notorious past of the Xe company, American press pays scant attention to it. By comparison, this topic gets far less attention than the wardrobe of First Lady Michelle Obama. The thin information on the issue is published from time to time on the web – usually on websites dedicated to military and private contracting – forcing Americans to keep track of information online, while the mainstream media prefers not to put it in the spotlight.